What makes Steven Spielberg so amazing is the fact he can make almost any story amazing. His best includes some of my all time favorite movies, including 1981’s “Raiders of the Lost Ark,” the following years “E.T. The Extra-Terrestrial,” “Close encounters of the Third Kind,” “The Color Purple,” “Schindler’s List,” and “Saving Private Ryan,” which won a well deserved Best Director statue from the Academy. 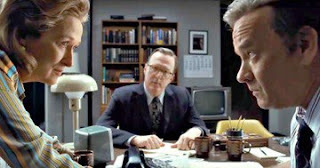 Now, with his latest drama “The Post,’ Spielberg re-teams with Oscar winner Tom Hanks for this based on a true story tale that looks at a pre-Watergate scandal involving president Richard Nixon and his misdealing with the Vietnam War. Hanks’s co-star is perennial Oscar w nominee and inner Meryl Streep who is Kay Graham, who essentially runs the Washington Post, a tough publisher who is looked at differently because she is a woman with authority. The pair share great on-screen chemistry and share screen time like they are old friends just catching up on the day’s work. What to me is the fact Hanks has been such a great go to actor for roles of any type. He does just fine as Ben Bradlee, who was important to oversee the day-to day dealings with the newspaper and cover everything in both Washington D.C. and the world. He already has his best actor statues with “Philadelphia” and “Forrest Gump.” Nowadays he just does projects that essentially still keep him relevant in today’s world. Honestly, I don’t see him embracing anything in the superhero realm anytime soon. Streep, as usual is aces in her as Graham, who essentially runs the newspaper she used to share with her late husband. The supporting cast all shine as well. This includes Bob Odenkirk, whose chatterer states he always wanted to be part of a smaller rebellion. Also amazing in her small part is Sarah Paulson as Tony, Ben’s wife and confidant. I have a feeling this one might be front and center in this year’s Oscar race. I could be wrong, however, since his 1985 gem “The Color Purple” was completely shut out of the win column entirely. So you know, it was nominated for 11 separate Oscars, but did not even land a single win in any category. My other predicament is that a newspaper movie just won the Busy Picture statue with last year’s amazing true life tale with “Spotlight.” The trouble is, the statues do not always go to the right person or entity. Regardless, this is a movie one needs to see in the theater. Yes, it is that good.